We brought it to Thanksgiving because I knew the family gathering would be the perfect venue to play. 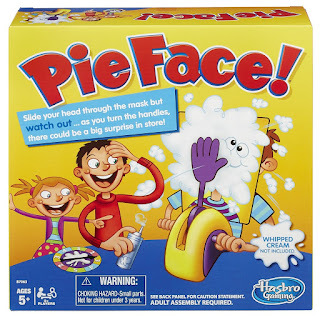 We sure did have a blast - nothing like seeing your grandmother or your 5 year old getting pie in the face. This game is a PEE-YOUR-PANTS good time! I highly recommend you find one for your family, play it at Christmas! My 5 year old had so much fun with this one! I think this makes the perfect holiday gift especially paired with a can of whipped cream! ARupLife.com DID NOT receive product, press or compensation to facilitate this review. This post may contain affiliate links. We only give our honest opinons of products. This post is in accordance with the FTC 10 CFR, Part 255 concerning the use, endorsements or testimonials in advertising.